Few artists can (or want to?) match the prolific pace of Lil B. The Bay Area–based enigma has dropped more than 30 mixtapes in the past two years, a feat that simply cannot be overlooked or even explained. And with each genre-bending release comes an equally off-kilter piece of art work. While some are clearly sloppy messes that were thrown together on MS Paint, others recall the madness of the Pen & Pixel era. We're talking loads of embossed and glistening fonts, golden dice, and, usually, a heroic image of the Based God. 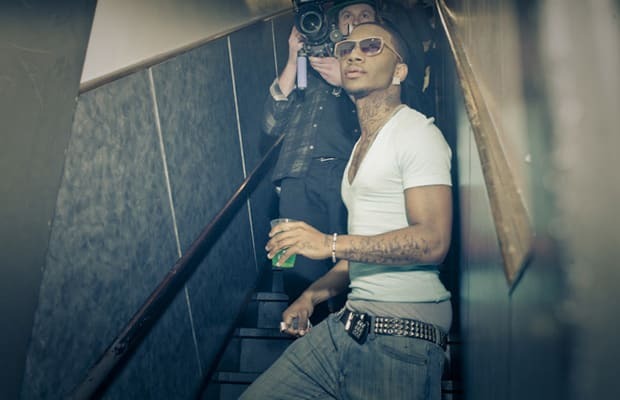 Whatever you think of his music or his art choices, there is no denying the unstoppable hustle of Lil B. And as we search for clues to unravel the mystery that is Lil B's psyche, these covers would seem to be as good a clue as any. Just as Rembrandt's 90 self-portraits formed a visual autobiography of the Dutch master, so do Lil B's 32 mixtape and album covers provide a peek into the mind of the Based God. With that, let's take a closer look at his finest and/or most absurd CD covers—all the way from 2009's I'm Thraxx through this past April's Trapped In BasedWorld.